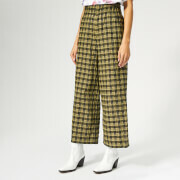 Women’s ‘Arquebus’ trousers by iconic British designer Vivienne Westwood's Anglomania collection. Cut from black cotton chintz in a shiny, glazed finish, the high-waisted trousers are tailored for an oversized fit and feature a concealed button fly and flap pockets to the sides. Finished with gathering to the rear to cinch the waist for added definition.